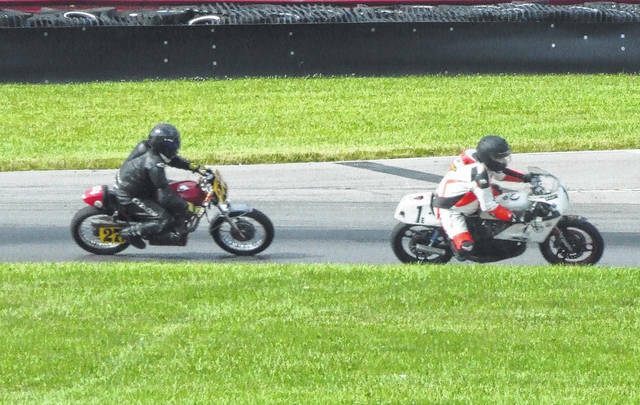 Friday rain didn’t keep the crowds away at Mid-Ohio Sports Car Course’s AMA Vintage Motorcycle Days last weekend. The Morrow County race track hosted several activities during the multi-day event, balancing road course racing with a slew of off-track events. In the campground area, there were motocross events, hare scrambles and trials. Dirt track racing also took place on Saturday at the Ashland County Fairgrounds. Seminars were held at the Mid-Ohio Tower all three days, covering topics ranging from the history of the Japanese motorcycle industry to bike restoration and keeping vintage motorcycles on the road. As always, the event played host to a large swap meet loaded with vendors. A Saturday poker run took place in the infield and there were several displays being shown throughout the premises, including those for both the AMA Motorcycle Hall of Fame Museum and Kawasaki Vintage Motorcycles, who were the featured brand for the weekend. There was plenty of entertainment, as music was played on an infield stage all three days, with Steven R. Trent of Canton and Beau Braswell of Nashville, Tenn. playing on Friday; Norwalk’s Death by Rodeo and Marion’s Sneaky Pete and the Players taking the stage on Saturday and Keith Jones and the Makeshifts playing Sunday. The American Motor Drome Wall of Death also was in the infield to provide entertainment for spectators, while the infield also featured bike shows and displays, vendors and a beer garden. After the weather cleared in time for Saturday’s action on the track at Mid-Ohio, motorcycles took part in road-racing action for the remainder of the weekend. 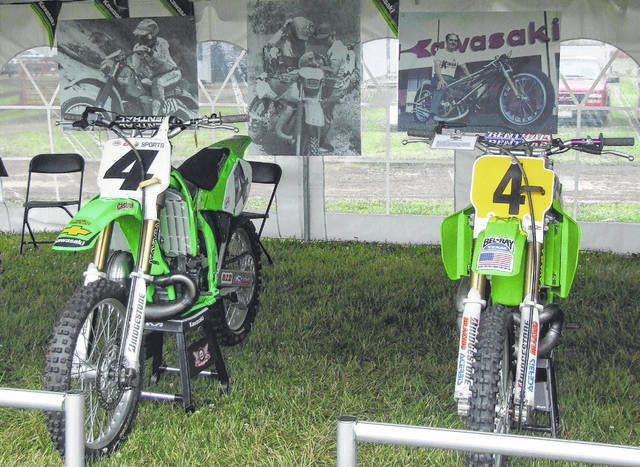 Kawasaki was the featured brand of the motorcycle at this year’s Vintage Motorcycle Days. 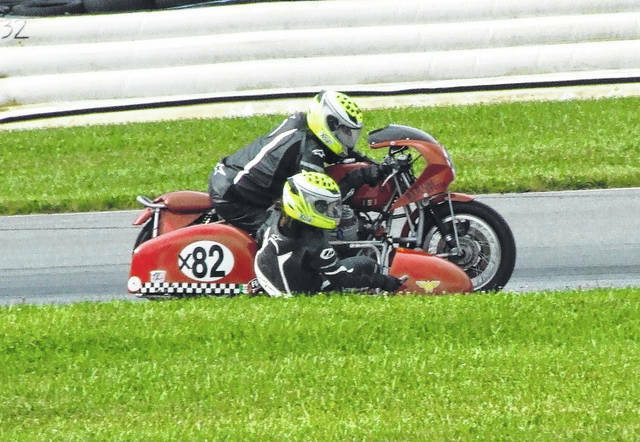 Sidecars also took to the track to participate in races at Vintage Motorcycle Days. 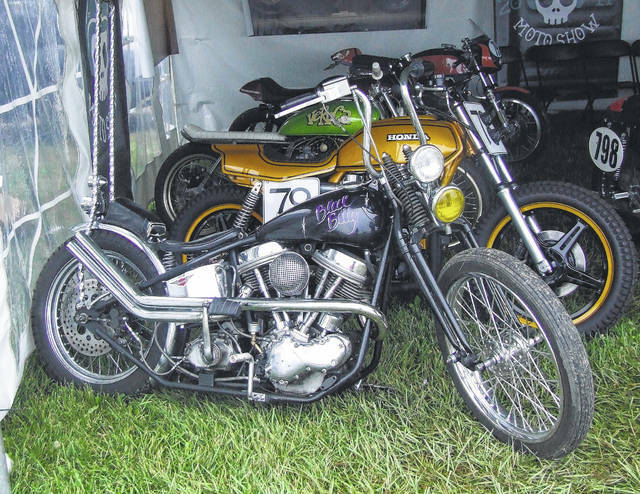 You could find bikes of many makes and models on display in the infield at Mid-Ohio last weekend. 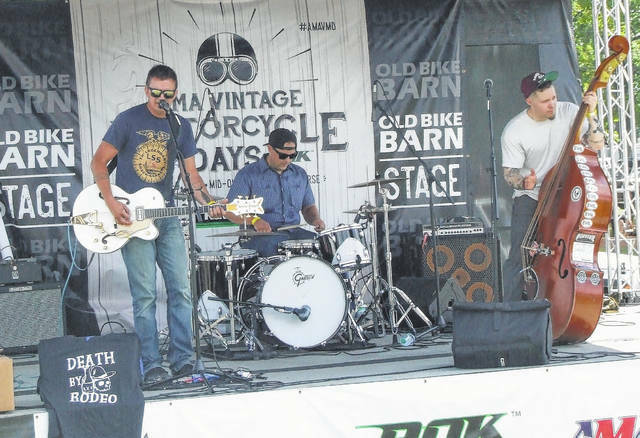 Norwalk’s Death By Rodeo was one of several bands to take the stage at Mid-Ohio’s AMA Vintage Motorcycle Days.